Aquatic Programs – Woodlake: Life on the Lake! Open to all​ members and non-members​! Check for specials and new classes on the Quest website. Group, Private and Semi Private lessons​ available. Low student-to-instructor ratio. All levels and ages, ​2 years through adult. ​Stroke School (Advanced), Int​ermediate, Beginner, Adult Learn-to-Swim, ​Adult Intermediate/Triathlete, ​Parent & Child. For information, go to "Swim Lesson News" at the top of the home page. For a list of classes and online registration, go to "Swim Lessons" on the left side bar of the home page. The Poseidon coaching staff endeavors to teach, train and motivate young people to achieve their ultimate potential in competitive swimming in the belief that this experience will prove valuable to them as they grow and develop. Opportunities are provided for each swimmer to compete at levels which are appropriate to his/her competence. The staff also strives to nurture high standards in personal development by instilling such concepts as time management, personal accountability, high self-esteem, constructive self-motivation, goal setting and goal achievement as these ideas relate to their success in training and in competition. It is our belief that the process of achieving is as significant as realizing the achievement itself. At each level of the Poseidon program, swimmers are taught to strive for excellence. Excellence represents the achievement of that level at which each individual knows that they have done their utmost to become the best that they are capable of becoming. 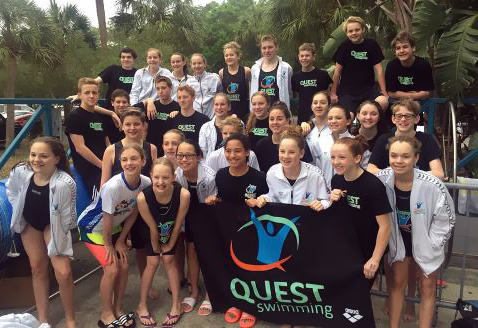 Mission Statement: To train, develop and motivate swimmers in the pursuit of individual excellence in a team oriented environment. Vision: The vision of Poseidon Swimming, Inc. is to be a nationally recognized leader in all levels of competitive swimming. Pursuit of Excellence (mind, body, spirit): To be the best you can be in all aspects of life. Commitment and Competitiveness: Persisting at a goal or task to completion while striving with competitors toward peak performance. Teamwork: Creating friendship and unity through shared experiences and competition. Rewarding: Fostering an environment that promotes fun and enjoyment. Sportsmanship: Learning to respect others through a strong foundation of values and ethics. To register for Poseidon, or for more information, please visit http://www.poseidonswimming.com.